Recently, Dr. Aaron Glassman* and colleagues have reported field resistance to Bt corn by western corn rootworm in portions of Iowa. Though this problem has been anticipated by many, this is the first scientifically documented & published occurrence of field-evolved resistance to a Bt toxin by the corn rootworm and any species of beetle. Prevention, and failing that, management of pest resistance is one of the major benefits of using IPM techniques in your insect management program. In KY we have all three major species of corn rootworm including the western. In KY field corn production these pests are extremely well controlled by our extensive use of crop rotation. Because of this high level of essentially “free” corn rootworm control, and the possibility of developing resistance when the population is exposed to the Bt toxin, we recommend NOT planting a corn product that contains the rootworm Bt events except in very specific circumstances. -OR- go to: http://www.plosone.org/home.action and type 222629 into the "search articles…" box. *Grassmann, A.J., J.L. Petzold-Maxwell, R.S. Keweshan, M.W. Dunbar. 2011. Field-Evolved Resistance to Bt Maize by Western Corn Rootworm. PLoS ONE 6(7): e22629. 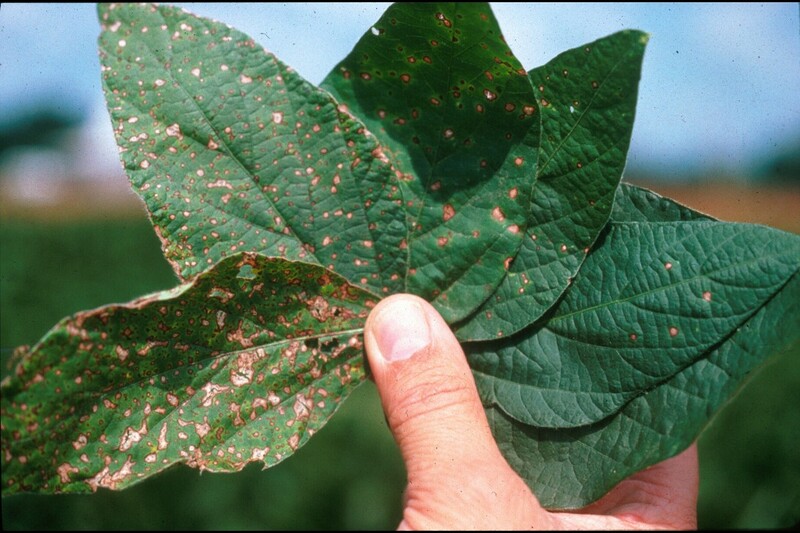 This is frogeye leaf spot of soybean. In order for frogeye to do much yield damage, it has to be active early. The frogeye is only able to infect leaves that are expanding or are scenescing. In other words, fully expanded leaves are basically immune to new infections and will only become susceptible once again when the leaves start to turn (pretty late in the game). The leaves that are showing symptoms now were infected when they were still expanding and you are just now seeing the results (infections probably 2-3 weeks old). Fungicides can only be used to prevent infections, but have no ability to control infections that have already taken place. Small lesions on leaves will continue to mature whether you apply a fungicide or not. In reality, frogeye can look pretty rough, but it must be pretty severe before yield is hurt much. Disease in the lower canopy is of no consequence. It must be severe in the upper 1/3 of the canopy to do significant yield damage. In order to have prevented the lesions you are now seeing, fungicides would have had to have been applied about 2-3 weeks ago, before infection. Then it is questionable if later applications after you begin to see symptoms, are of much value because by the time older leaves become susceptible again, the crop is likely to be made. Bottom line: it is either too late to do anything, or nothing needs to be done. The only outlier is if you have a late planted field that still has a long way to go (like currently at R3), then treatment may be justified since the plants will still need to put on new growth. The fungus can also infect pods and reduce seed quality, so if you are thinking about saving seed, it may be good to apply a fungicide to protect seed quality. Both strobilurins and triazoles give good control of frogeye. The dry weather is expanding across the state according to the drought monitor posted on Aug. 16, 2011. About 50 percent of the state - and 90 percent of the grain crops area - fall into the "Abnormally Dry" category. The map from a week earlier estimated that about 17 percent of the state was in the same category. Similar trends can be seen across the Midwest as well. Are you cooling your wheat? With 80o days and 60o nights, combined with low humidity, now is a prime opportunity to begin lowering the temperature in your wheat storage bins. Since the growth, reproduction, feeding and movement rates of insects are all governed by temperature, lowering your grain temperature will only help control stored product insect infestations. Certainly we will still have plenty of warm days left before truly cold weather sets in. Nevertheless, starting to lower stored grain as early as possible will simply aid in reaching that point were insect infestations can no longer continue to increase and cause damage. See Kentucky Pest News No. 1281 for Aug 16, 2010 at: http://www.uky.edu/KPN for more information. Earlier in the season, we tried to warn about planting too early and the risks of sidewall compaction. Nick Roy, County Ag Agent in Adair County did some yield checks in a field with and without sidewall compaction. Below are his reports. All yield checks are from the same field. Forms for both the Kentucky Soybean and Kentucky Corn yield contests are available online at the Grain Crops Extension website. The Soybean contest includes divisions for both tillage and no-tillage as well as seed quality awards. The Corn contest has updated guidelines for its divisions. The four divisions are the same: Tillage, No-Tillage, White and Irrigated. However, the No-Tillage division is updated to coincide with the NCGA Corn Contest and follows a stricter definition of no-till. Entry into either contest is free and is completed by harvesting the crop according to the rules and submitting the proper forms in the proper time. Strong winds this past weekend knocked down corn in central Kentucky. 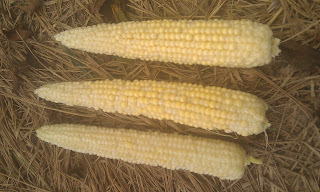 Much of that corn was in the dent stage (growth stage R5) and had not reached blacklayer (growth stage R6). Those kernels will prematurely reach black layer and will be lightweight. Furthermore, these kernels will be above 35 percent grain moisture, but drydown will be hindered. Many fields across the Midwest had downed corn in July and that corn was at growth stages where it could recover, some, from the damage. Corn at R5 and R6 is too far along to recover from the damage. The only thing now is to salvage the crop for either grain or silage. In the August 16, 2011 Kentucky Agri-News Report, the National Agriculture Statistics Service expects corn yields for Kentucky are at 145 bu/acre and soybean yields are expected to be 40 bu/acre. Both yield forecasts are up from the 2010 season. The 2011 forecast has both corn and soybean at 27 percent increases from 2010, with 194.3 million and 60.0 million bushels for corn and soybean, respectively. The reports assumes adequate weather for the remainder of the season and no dramatic weather events that damage the crop. There were some reports today that corn was blown over in central Kentucky. Much of the corn was in dent but not at blacklayer, so yield potential was cut short. More events like this could cause the September forecast to be reduced. Now is a good time check fields for pollination problems. The high temperatures may have caused problems in some fields. See the images below. While we don't expect all fields to look like this, some will. Scouting now will help producers identify some options for this fall (even if the only options left are in marketing). The blank kernels on these ears are from poor pollination. Heat stress is the most likely culprit. Image source: Nick Roy, Extension Agent, Adair County, Kentucky. 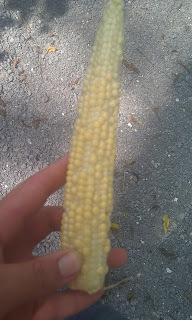 The blank kernels on this ear are the result of poor pollination. Heat stress is the most likely culprit. Image source: Nick Roy, Extension Agent, Adair County, Kentucky.